Innovate your business with Promultis Object Recognition. This unique interactive solution has become increasingly popular in recent years and as such, Promultis has striven to create interactive object recognition solutions like no one else. The hands on interaction makes for a truly memorable and engaging experience. Not even mentioning the added wow factor and data collection possibilities that Object Recognition can bring to your business! If you would like to find out more about our object recognition capabilities, or if you would like to arrange a free of charge, no obligation demonstration at your place of business, please do not hesitate to call us on +44 (0) 239 251 2794 and speak to one of our experts today! Promultis Object Recognition allows you to place an object on screen and bring up any information you choose. Our all new object recognition solution allows you to open information from a tiered menu system that follows the object. We can take this one step further and use the orientation of the object marker on screen to open specific information. -A cocktail bar with a Promultis Drop-in Insert could have the display recognize specific beverages, for example, when a cocktail is put down, the ingredients could be displayed or the consumer could be asked to rate their drink. They could have the option to share this information to social media and raise your brand awareness while at the same time providing your business with valuable insights into the popularity of certain products. -Not all content has to be visual, sound can also be utilised to great effect alongside visual elements. A museum could have objects trigger sounds when placed onto a screen. Perhaps the sound of particular animals, historic cars, different languages as just a few examples. -A cinema could have objects related to particular movies such as a character or logo. 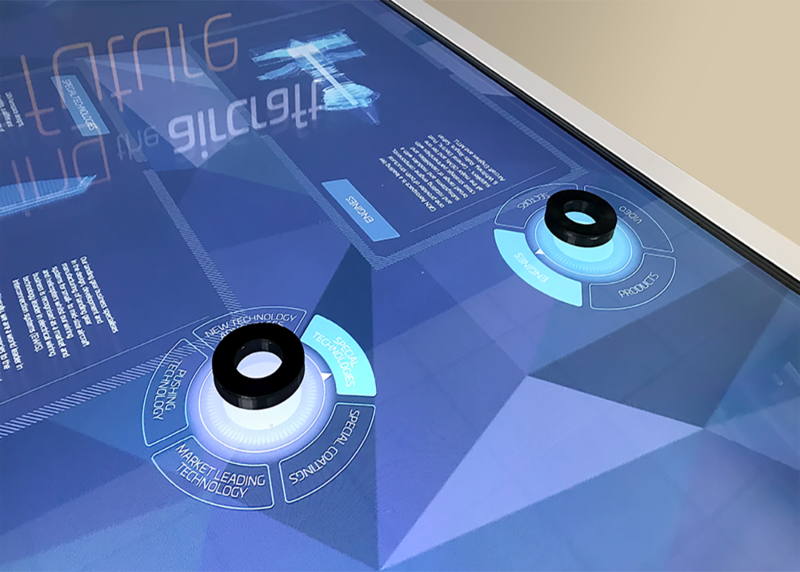 When placed on a Promultis multi touch table, the trailer for the movie could be shown. Using our new object recognition solution, information such as the director, cast and crew or movie trivia could be pulled in from online sources and put into a menu that moves with the object. Going further, customers could pay for tickets via QR code or an added payment terminal and receive printed tickets. -A car dealership could have models of their vehicles that when placed on a Promultis multi touch screen, could bring up technical specs of the car and play a video. The objects could even trigger an interactive specification builder allowing the customer to continue using the multitouch screen, specifying the options on that particular vehicle. Not stopping there, the customer could even ‘swipe’ the finished spec onto a larger screen or video wall and see the final vehicle to scale! Touch screen insert with bespoke object recognition technology.